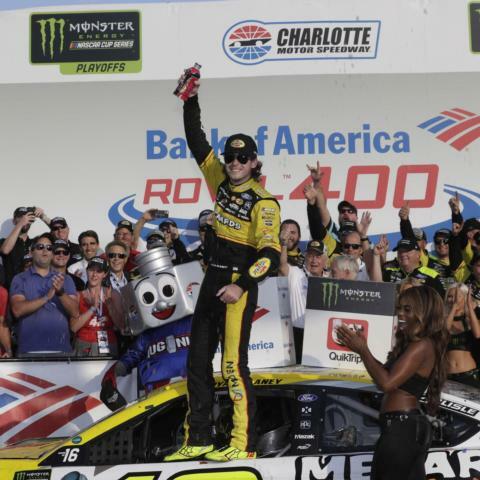 Sunday's inaugural Bank of America ROVAL™ 400 - arguably the most anticipated Charlotte Motor Speedway race since the first superspeedway night race in 1992 - exceeded the hype in spectacular fashion. 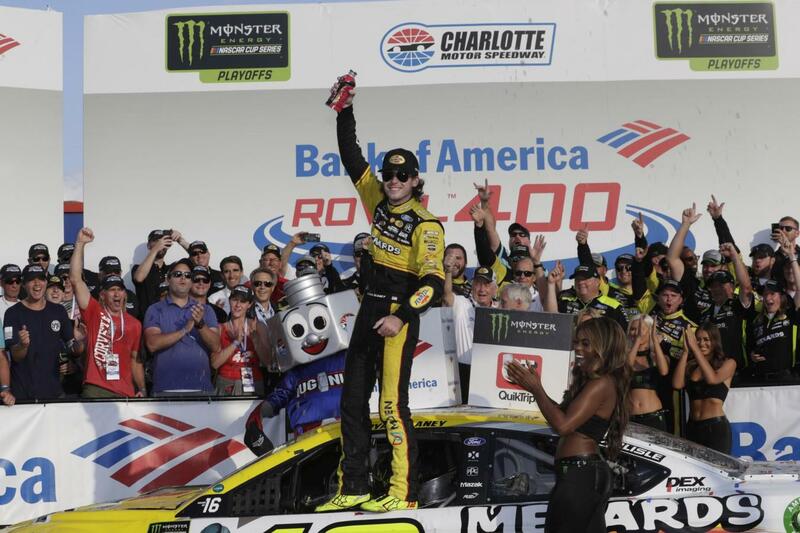 Sunday's inaugural Bank of America ROVAL™ 400 - arguably the most anticipated Charlotte Motor Speedway race since the first superspeedway night race in 1992 - exceeded the hype in spectacular fashion. A dramatic 109 laps of racing built up to a last-lap, last-turn accident between leaders Martin Truex Jr. and Jimmie Johnson, which paved the way for Ryan Blaney to emerge unscathed to record a stirring victory. The first road-course playoff race in Monster Energy NASCAR Cup Series history served up a double dose of excitement. Sixteen playoff drivers battled to maintain their championship hopes in the cutoff race of the first round, contested for the first time on Charlotte's 17-turn, 2.28-mile ROVAL™. Kyle Larson led a race-high 47 laps, won Stage 1 and figured to be in the driver's seat to win. A lap-104, Turn-1 accident following a restart left Larson's car with severe damage and eliminated contenders including Kyle Busch and Brad Keselowski. Truex inherited the lead and engaged in a breathtaking battle with Jimmie Johnson over the final two laps. Heading into Turns 16 and 17 - Charlotte's new frontstretch chicane - Johnson dove in deep, spun his car sideways and collected Truex as Truex exited the corner. Blaney beat Jamie McMurray and Clint Bowyer to the finish line as Johnson righted his car and finished eighth. Even after Blaney recorded his second career victory and Truex crossed the line 14th, the drama wasn't over. Larson needed to gain one position on the final lap in order to advance in the playoffs - which he picked up after Jeffrey Earnhardt spun following contact with Daniel Hemric. Larson and Aric Almirola were the final two drivers to advance to the Round of 12, as Johnson's spin and ensuing result saw the seven-time series champion lose a tiebreaker for the final position after an afternoon of exhilarating action on the ROVAL™. "It was really an amazing day; a three-year journey to get here," Speedway Motorsports, Inc. CEO Marcus Smith said of the ROVAL™. "Everything we saw from the competition today was phenomenal. The track was very raceable. I think this was another of those amazing, memorable moments for me and certainly for NASCAR. I think it lived up to its hype. … I wanted there to be an opportunity to pass for the lead, for the win, and on that last lap, what happened is not what I imagined. I think it was incredibly exciting. The roar from the fans was all I needed to know. That was the moment that everyone will remember for a long time. It was certainly more than I had expected in terms of excitement for our fans." RYAN BLANEY, No. 12 Menards/Pennzoil Ford (Race Winner): "When I got out of the bus stop, I could still see them through (Oval turns) 3 and 4. They were really close to each other, and Jimmie (Johnson) was almost pushing him. I was like, 'Might get physical here.' I don't know what happened, and by the time I was able to see something, Jimmie was sideways. When they were sitting there, I almost wrecked trying to get through the chicane as fast as I could. You're trying to make up time and seize the moment. It was kinda disbelief. I didn't know what to think. I was kinda shocked that something like that happened, and you're lucky to be in that spot. Luck has not been on our side very often, and sometimes you find a nut. Luckily, it worked out for us. … It's really big to be able to win for Roger (Penske). Obviously, that's not the way I want to do it. I want to go out and dominate the race. Whenever you win something like this, it's a weird feeling. I don't really want to call it an undeserved feeling, but it's just kind of an odd feeling. But we put ourselves in a good spot. It worked out for us. When I was running third, I was thinking about points. We were good on points, and I was cool with riding around in third. Then that situation happened, and it was good to be there." JEREMY BULLINS, No. 12 Menards/Pennzoil Ford (Winning Crew Chief): "We got a lot of stage points today. And we needed to get every one we could. We made a play to win Stage 2. We knew we were going to have our work cut out for us in the final stage. But it just worked out. We had fresh tires at the end. All of the cautions helped us gain track position. When everybody got together there at the end, we saw the track map and knew coming to the finish was going to be interesting. And it was." ROGER PENSKE (Winning Car Owner): "Everyone really wondered what was going to happen with the ROVAL™. And I think the fact that it was the cutoff for the next playoff race made it more interesting. There was so much strategy going on, a lot of racing there at the end. It was a terrific show. Jeremy (crew chief Jeremy Bullins) made a good call there so we had plenty of fuel there at the end. The clouds kind of parted. Overall, it's a great day." JAMIE MCMURRAY, No. 1 DC Solar Chevrolet (Finished 2nd): "Yeah, our DC Solar Chevy was really good all day long. We got a little bit off in the last pit sequence. We got a little bit behind, but had a really good car and then we had the one restart when Brad (Keselowski) was on the front row and I happened to be on the inside and that was the lane to be in so you could avoid the wreck. And then on the last restart, I got a good restart being on the outside… a little bit disappointed only because my left-side mirror fell off in the chicane with like 25 laps to go and I ended up having to let the No. 12 (Blaney) go because I couldn't see if he was inside of me. I don't think he was. I'm like, if that wasn't the case, you would be the guy in Victory Lane now versus finishing second, but overall it was a pretty fun day. I thought Marcus (Smith) and the team here did a really good job getting the track ready. It's crazy that we ran a road course inside of this facility, but it's a really great place." CLINT BOWYER, No. 14 Mobil 1/Advance Auto Parts Ford (Finished 3rd): "We knew we needed an opportunity. I knew this race was the opportunity. I just didn't know if we could capitalize on it. We knew some people were going to have trouble. I tried to make sure we weren't one of them. We did a good job of bringing a fast race car in qualifying. That put us in a position to get those stage points and get ourselves at least on the dance floor. You get behind and when I got back up front I had both fenders knocked in and then hit one of those turtles (blue rumble bumps). That's all a product of being back in the field. Then we were racing the 88 (Alex Bowman) for position and a point. Then at the end, it was mass chaos. You knew something was going to happen with this deal. Everybody dubbed this the wild-card race. I guess I'm lucky I survived it but I'm happy for our sport. It's lived up to the expectations. I knew that first round was going to be tough. There wasn't much sleep the last couple of nights. Now it's time to think about a cold beer 'cause I really want one." ARIC ALMIROLA, No. 10 Smithfield Ford (Finished 19th, won playoff tiebreaker): "We just battled adversity all day. That last restart, they told me we were minus-6 points and I needed to go. I rifled it down into Turn 1, wheel-hopped and cleared a few of them out and got by three. Those last couple laps, I was able to get those last three spots. 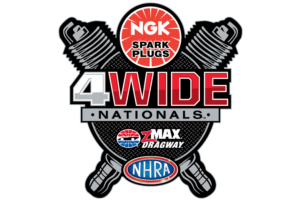 … When we came back around, they told me I was tied, and it happened to be good enough because of our finishes the last couple weeks at Las Vegas and Richmond. That was the tie-break. I told (crew chief) Johnny Klausmeier going into this weekend all I really cared about was leaving here plus-1. Turns out, plus-0 is good enough." KYLE LARSON, No. 42 Clover/First Data Chevrolet (Finished 25th, won playoff tiebreaker): "I knew I was in bad shape and I guess you could say I had given up. I couldn't even drive my car it was so bad, just destroyed. But then they said they were all crashing there coming to the checkered. I was getting on the oval, and they said they were starting to crash, so I ran hard. We had so much camber and toe in our car, they said if I ran fast, I could blow a right-front. I was like, 'You gotta go.' I ran hard through (Turns 9 and 10) and through the bus stop and blew a right-front in the center of (Turns 13 and 14) and plowed the wall. I said, 'Crap, I don't know if I'll be able to get down to make the chicane, but luckily it came down off the banking. I could turn right OK and got through the 16th corner and in 17 I hit the wall again on the frontstretch. They told me the 96 (Jeffrey Earnhardt) was stalled when I was on the backstretch and wasn't able to get his car going. He was 100 feet from the start-finish line, and I could see him start to creep as I was getting to Turn 16. I was like, 'Gosh, don't go, don't go.' We were able to make it. It was pretty lucky."